With the Smartphone ATEX, IECEx and Class 1 Zone 1, Delvalle unleashes the power of modern smartphones in explosive atmospheres. Take DIGITAL manuals right to the heart of maintenance operations, continously monitor the health of your lone workers, support personnel via video conferencing, measure environmental conditions such as toxic gases remotely. It is all possible with Delvalle smartphone ATEX and IECEx. Delvalle smartphone ATEX can be submerged in water for 40 minutes, even at 1.2 meters depth. 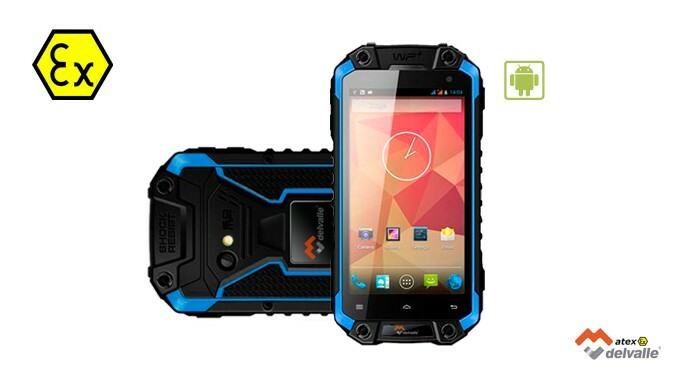 It’s the rugged waterproof phone that can handle any humid location. Think only of the possibilities in a maritime context, or in healthcare workplaces where disinfection is required. Delvalle is extremely robust, and even MIL-STD-810G certified. As a result, this rugged smartphone resists shocks to a far-reaching extent. It’s what makes them so ideal for usage in construction, transport, logistics, or even for military purposes. Delvalle ensures you’re always connected. Its Dual SIM Quad Band enables smarter roaming solutions. Data exchange is possible via WIFI or a mobile net¬work. Data and voice connections run simultaneously. Moreover, Bluetooth connectivity enables countless extras such as helmet communication, LEL metre and more. Android-based, Delvalle smartphones can run numerous applications: track & trace, man down, compass … They will seamlessly fit into your enterprise’s workflows. Shoot the sharpest images thanks to the Delvalle 8 Megapixel CAMERA. Disfruta de las fotos en alta resolución y de aplicaciones de video en streaming. The smartphone’s 4.5” display is easily readable at all circumstances – even when sunlight is shining directly onto the screen.